In a recent packaging study conducted by Bongo International, a global e-commerce solution provider, sixteen e-retailers realized savings ranging from 24% to 57% in international shipping costs. Bongo offers a repackaging service addressing the difference in international and domestic shipping calculations which is an area where many retailers lose revenue. At this rate, if just 20 international parcels were shipped per month for one year, this would result in over $10,560 in savings. Sixteen e-retailers achieved savings averaging 32% in international shipping costs in a recent packaging study conducted by Bongo International, global e-commerce solution provider. Expanding globally is now recognized as a guaranteed revenue generator for domestic retailers. The down side to this is the majority of retailers haven’t shifted the packaging process to correspond with international shipping rate calculations. Most retailers maintain domestic packaging which becomes a financial drain when shipping globally. Bongo has resolved this issue through a streamlined repackaging service. This process removes excess packaging while maintaining the security of the items in international transit. The study involved over 5,000 packages ordered online from these retailers by consumers located throughout the world. Once the international orders were placed, the packages were shipped to a U.S.-based international distribution center, where export compliance paperwork was completed and the parcels were checked for possible repackaging. As a result, orders were often repackaged according to international dimensions, reducing final shipping costs by an average of 32% across all retailers in the study. The reason for this discrepancy is due to the different calculations for international vs. domestic shipping weights. International shipping rates are calculated in one of two ways; either according to the dimensional weight [the space the parcel occupies], or the actual weight – whichever is greater. This figure is referred to as the billable weight. The equation utilized to calculate international dimensional weight is LxWxH /139. The domestic equation is the same, only the denominator is increased to 166 (LxWxH/166). The domestic calculation has resulted in ample wasted space in the majority of parcels as additional space doesn’t weigh in domestically as much as it does internationally. Retailers will typically utilize filler paper, peanuts, etc. To a certain degree this is used to safeguard the items. Frequently however, this is just wasted space with no significant purpose that becomes part of the shipping cost in international parcels. Note the examples provided and the small difference in domestic shipping costs of a 9lb parcel reduced to 7lbs is only 49 cents (see example). This slight difference domestically is the likely culprit as to why most retailers don't recognize the value of repackaging until they begin shipping internationally. The international shipping rate for a 9x9x9 in. 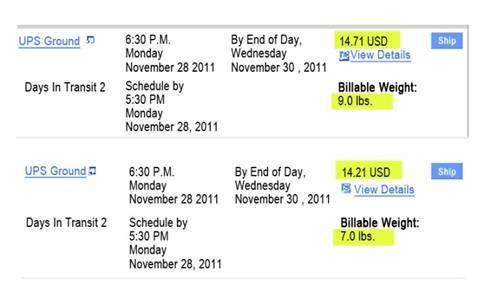 package reduced by 2lbs in billable weight afforded a $44 USD savings as a result (see example). At this rate, if just 20 international parcels were shipped per month for one year, this would result in over $10,560 in savings. The reputed *CMOSurvey.org analyzed what percentage of U.S. company sales comes from international markets. The survey found that international sales increased from 19.3% in August 2010 to 24.7% in August 2011, and this percentage will only continue to increase. Retailers expanding worldwide should carefully monitor the process to be certain they aren’t losing revenue at obvious pain points. Proper packaging is one of the most basic, yet effective, means of doing so. The analysis was conducted involving sixteen major retailers such as Amazon.com and PotteryBarn.com amongst others. 5,145 total packages were shipped internationally utilizing retailers’ regular packaging procedures. Bongo International offers the repackaging feature as an option in each of their current e-commerce solutions. Macys.com benefited the least from repackaging, yet was still able to reduce shipping costs an average of 24%. This figure applied to the number of packages shipped globally constitutes what retailers should consider as a major shift in how international parcels are managed. The final results of the full analysis can be found by clicking here, or by visiting Bongo’s website at http://www.BongoUS.com/whitepapers.php. For more information on repackaging services offered through Bongo International, contact Jennean Morrison, Product Manager, with Bongo International at 203.683.4894, ext. 311 , or via e-mail at Jennean.Morrison(at)BongoUS(dot)com.